the Republican National Committee spent had spent more than $150,000 on the the VP candidate's clothing and makeup, Michelle Obama appeared on "The Tonight Show" and told Jay Leno that she has more modest taste. "Actually, this is a J. Crew ensemble," she said of her yellow sweater, skirt and blouse ensemble. "You can get some good stuff online," she added. 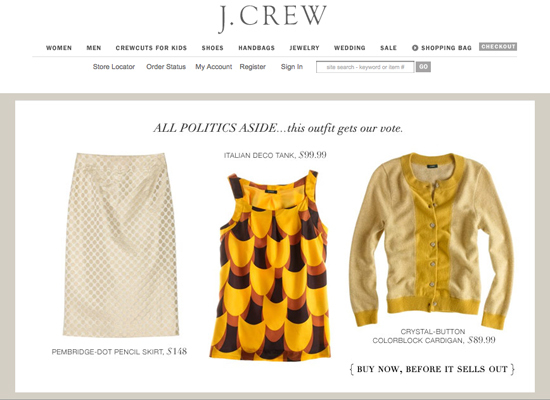 Well, now J.Crew is cashing in on the would-be First Lady's endorsement, advertising the ensemble as Michelle Obama's Look and urging shoppers to "Buy now, before it sells out". Keep reading about Michelle Obama's style. Watch the Obama family discuss dressing on a budget on "Access Hollywood."